Ingrid Fetell Lee is a designer and the founder of the blog The Aesthetics of Joy. She has been featured as an expert on design and joy by outlets such as the New York Times, Wired, PRI's Studio 360, CBC's Spark, and Fast Company, and her 2018 TED talk received a standing ovation. Lee was formerly Design Director at global innovation firm IDEO, and was a founding faculty member in the Products of Design program at the School of Visual Arts in New York City. She holds a Master's in Industrial Design from Pratt Institute and a Bachelor's in English and Creative Writing from Princeton University. "Joyful overturns conventional wisdom about happiness: that it comes from within, and that experiences -- not things -- make us happier. Ingrid Fetell Lee's delightful book evokes the same positive feelings she describes. It is full of whimsy, wonder, energy, and joy. I loved it." 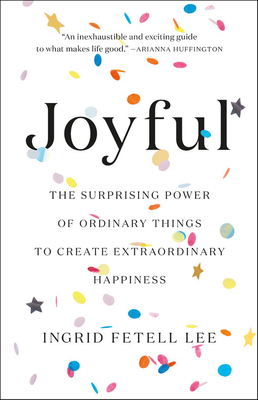 "Joyful is a delightful book with a powerful message: joy is easy to find if you know where to look. In Joyful, designer Ingrid Fetell Lee explains why some experiences are laden with joy, explores how we can cultivate these experiences every day, and shows us how to identify the most joy-inspiring people, places, and objects in our lives." "Joyful is an invaluable field guide to discovering delight in all its forms. It's hard to look at the world -- and your place in it -- quite the same way again."